Combining both the old and new, Singapore has kept its roots yet developed as one of the fastest growing nations. The one place where this is most evident is in the Central Business District Area, and Raffles Place in particular. 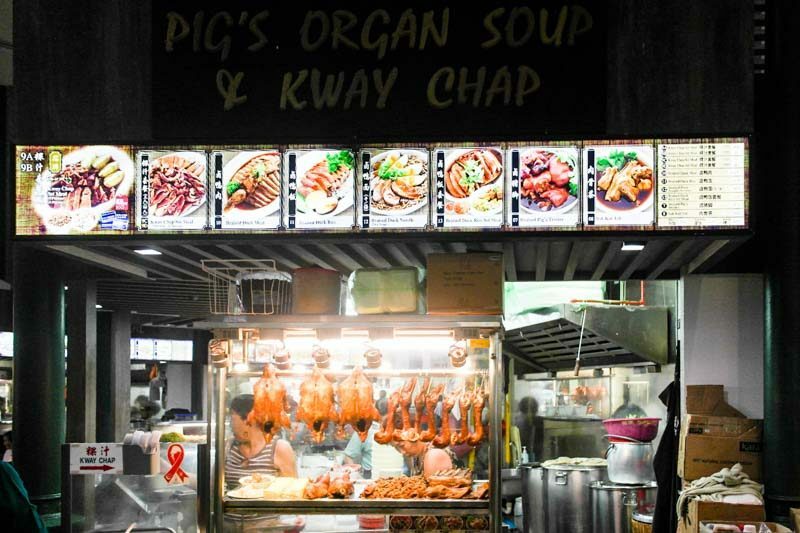 Amid the tall, glitzy buildings in Raffles Place, there is a peppering of traditional hawker centres that still keep true to Singapore’s humble beginnings. 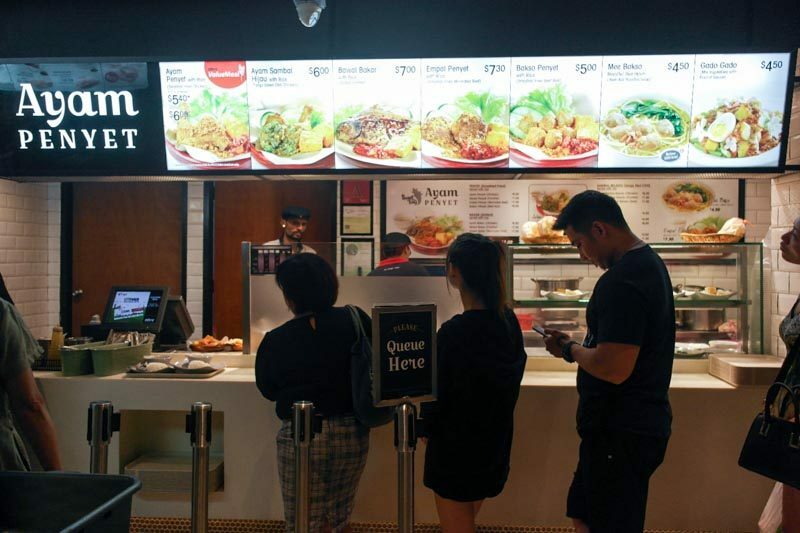 Time-pressed office workers are always looking for nearby food centres where they can spend a very reasonable amount of money on delicious foods – it’s always more expensive to eat in the CBD. 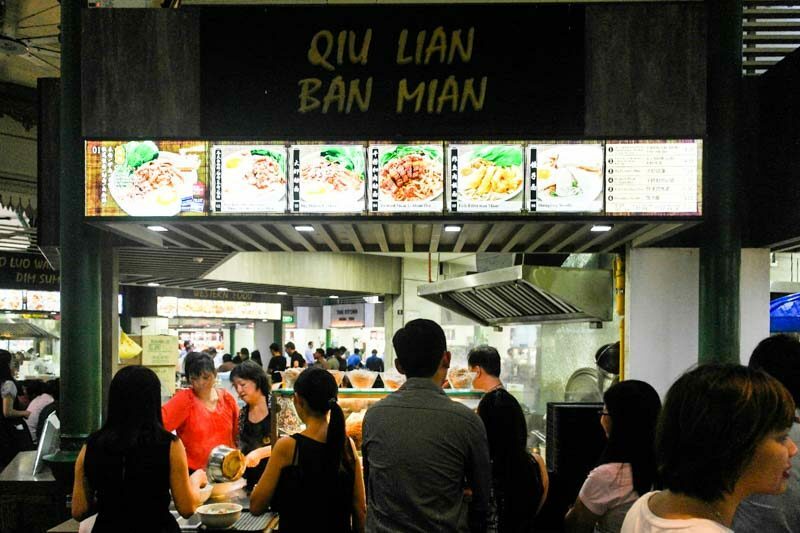 People can get tired of routines, however, and so, if you are a Raffles Place-office-dweller and are on a lookout for new, affordable hawker stalls to try, this food guide is tailored for you. 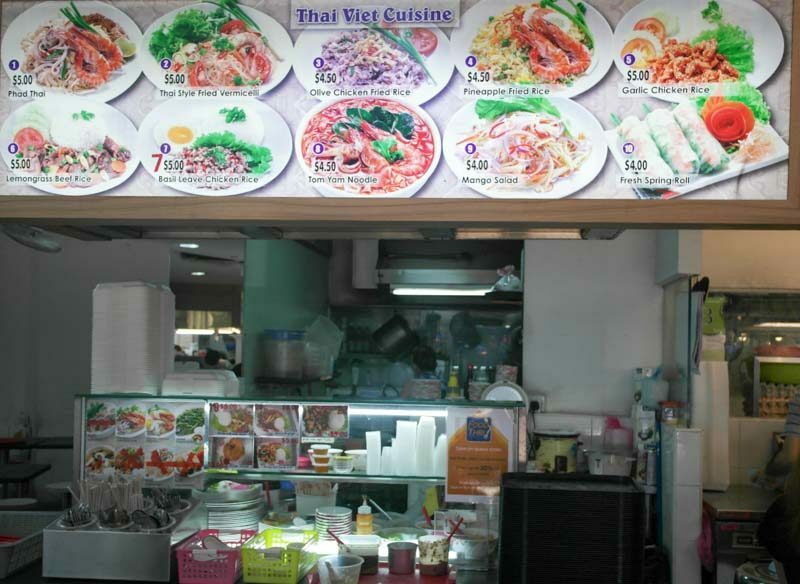 I have sectioned out a few prime areas in Raffles Place where there is a statistically higher number of good food stalls, but do share more of your hidden finds in the comments too. 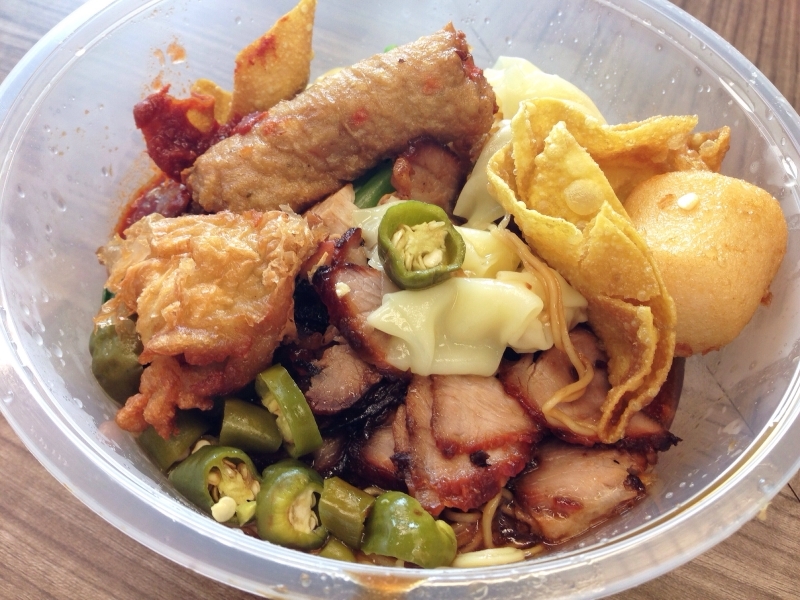 Now, let us begin with Lau Pa Sat. Save the eye-rolls and harrumphs, I am fully aware that most, if not all who work around Raffles Place already know what Lau Pa Sat is, where it is and what it has to offer. 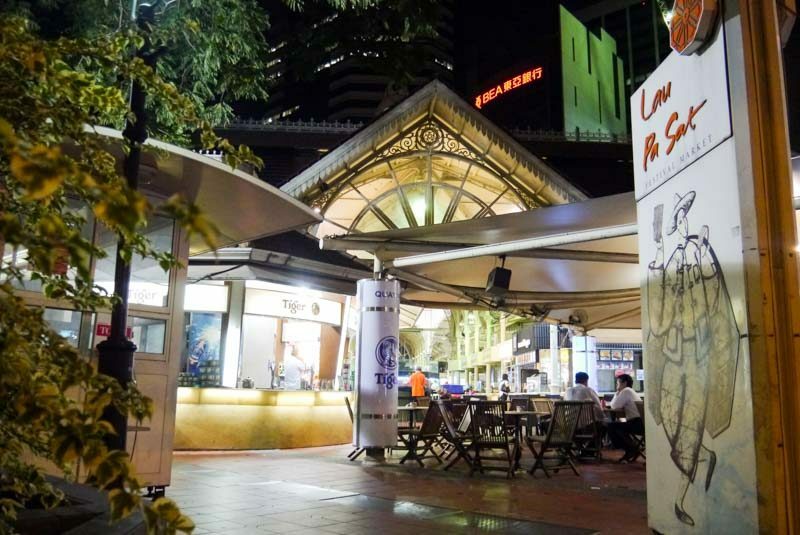 But this list would not be complete without Lau Pa Sat (a hawker centre that has become slightly more “tourist-y”) and this place does have to offer quite a few good hawker stalls. As someone who values a good ol’ plate of greasy local food, I went for Seng Kee Local Delights first to grab a plate of Char Kway Teow ($4). Since this was the first stall I tried in the Raffles Place area, I was pleasantly surprised when I found out that the prices were not inflated just because of the location. Cost aside, I really liked this plate of Char Kway Teow because apart from the grease, there was a good amount of other ingredients like chinese sausage, cockles, fishcakes and bean sprouts tossed into the mix and the noodles had a lovely charred taste. The dish was just overall very tasty and I had zero regrets. This stall also sells other tasty local delights like Hokkien Mee and Laksa which, judging by how the Char Kway Teow was, probably tastes just as great, if not, better. 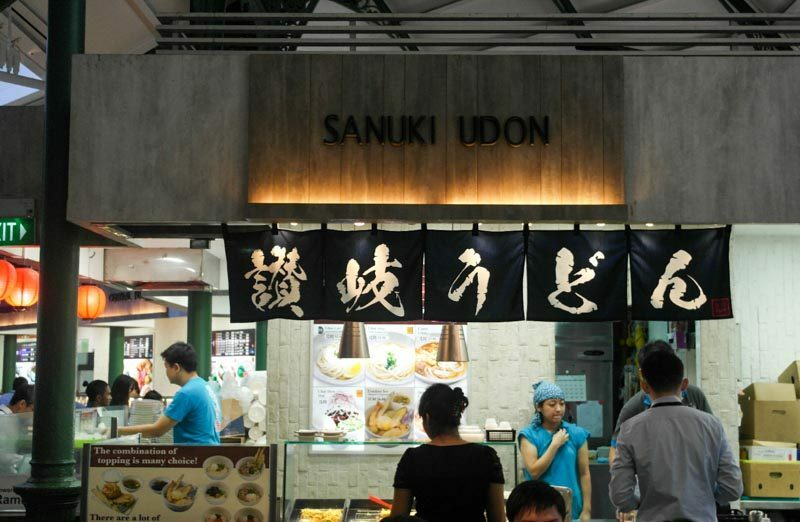 The next stall I tried at Lau Pa Sat was Sanuki Don, mostly because I had a sudden craving for Curry Rice. All I have to say is that I was not let down. 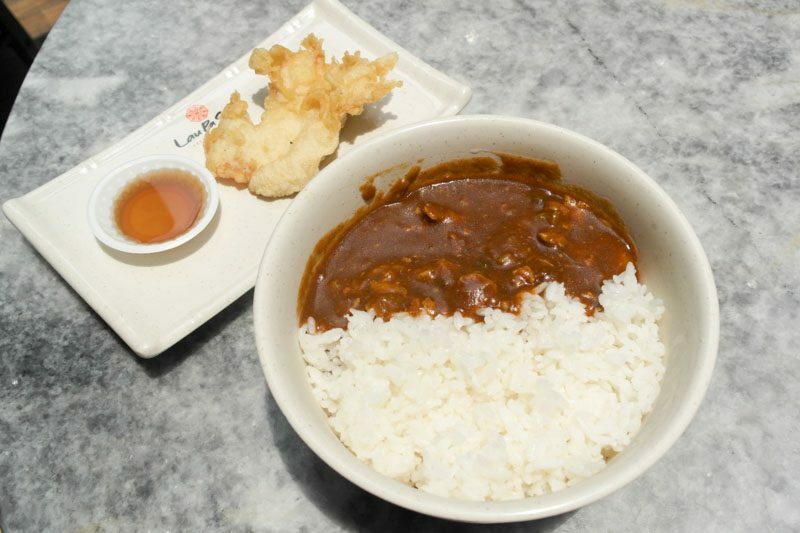 I ordered Japanese Curry Don ($5.90) and Kashiwa-Ten (Fried Chicken) ($1.80) and was very satisfied by the time I licked my bowl clean. This might sound slightly exaggerated but I just really enjoyed the Curry Don, not only because of the thick, savoury curry but also because of the fact that the crispy chicken when lightly dipped into soy sauce intensified the flavours of the entire dish. There were at first unknown-looking chunks of meat in the curry which turned out to be beef as an added bonus. 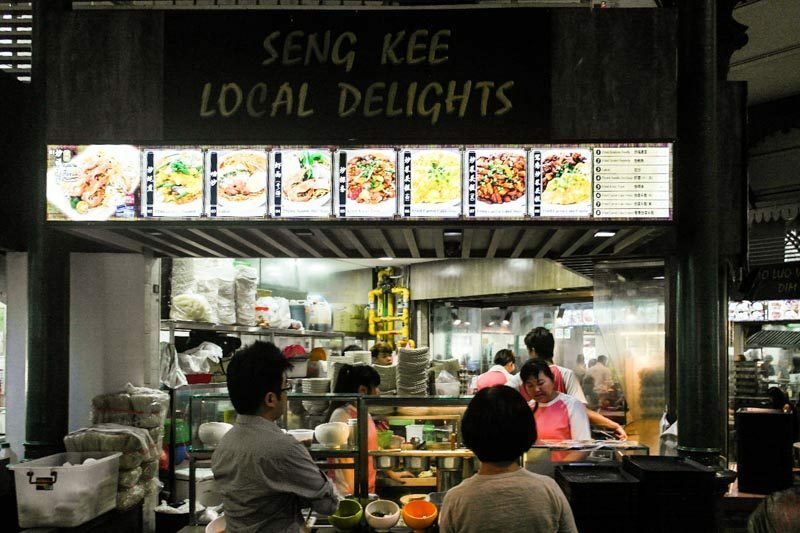 Song Kee Fishball has made a name for itself island-wide as one of the best fishball-making, meepok-serving stalls and with good reason too. 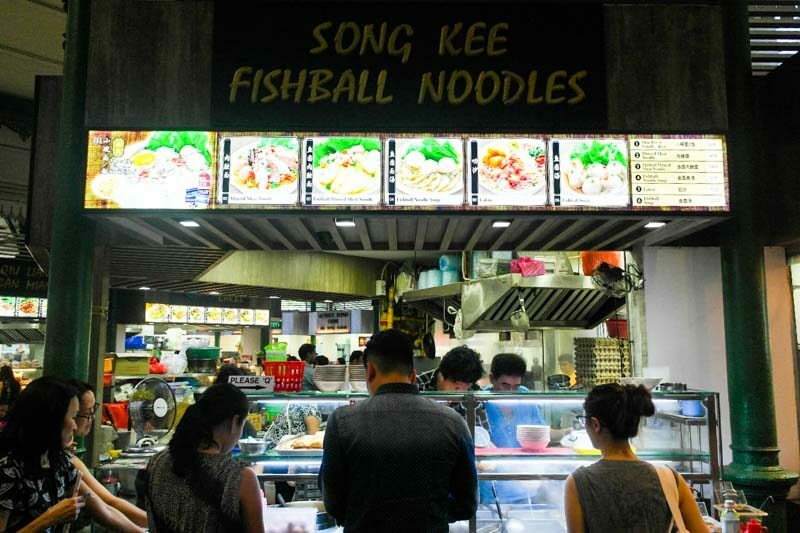 For a mere $4, you can get a sizable bowl of delicious fishball noodles. 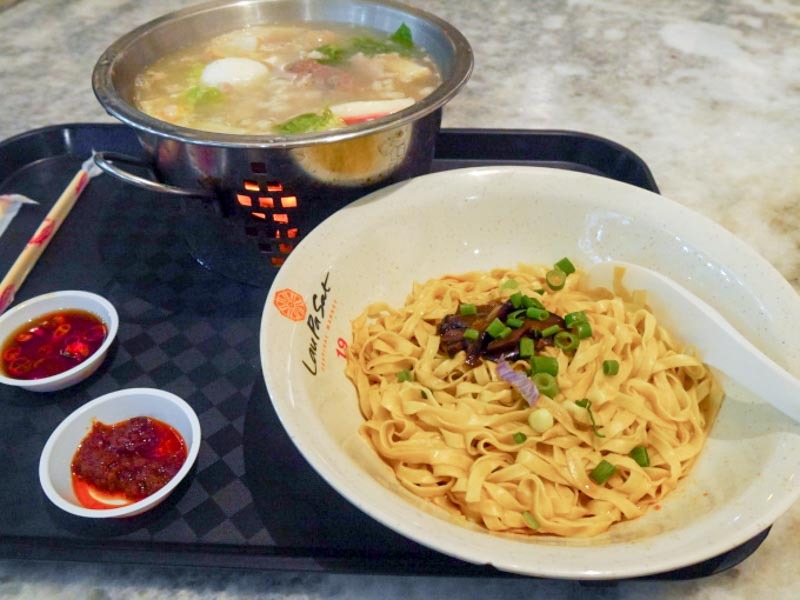 The noodles are springy and sauced up nicely and goes beautifully with the fishball soup, within which tasty handmade fishballs bob up and down. 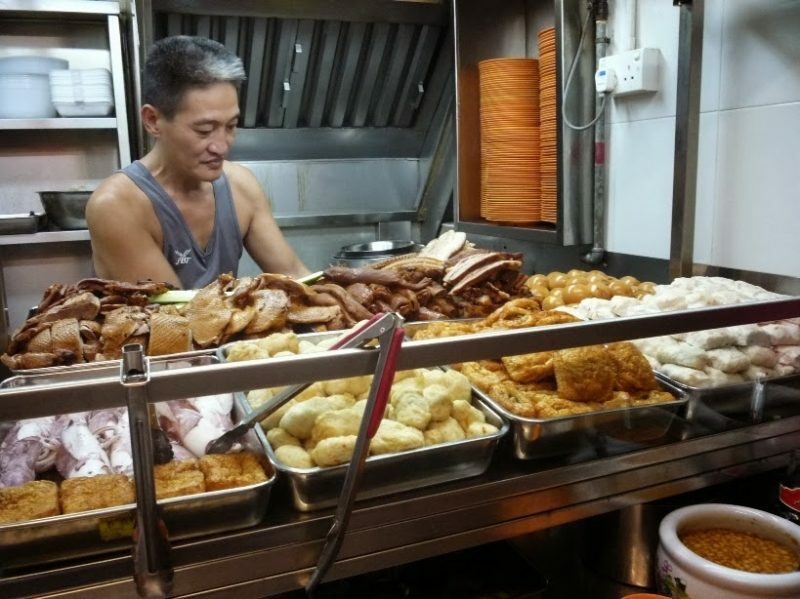 One of the winning qualities of the food served at this long-time-standing stall is the fact that it has no “pork smell” and the braised sauce used for the kway chap is extremely savoury. 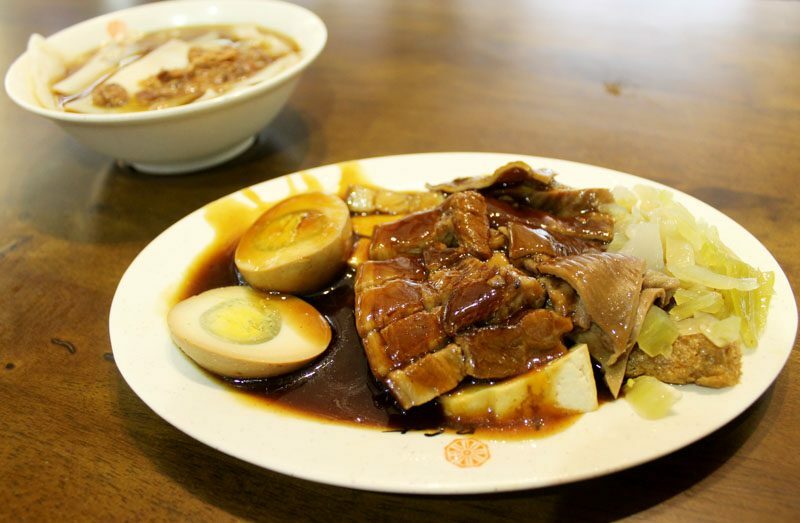 Have the kway with the braised pig innards, tofu, egg and a good amount of the dark syrupy sauce to fully enjoy the dish. 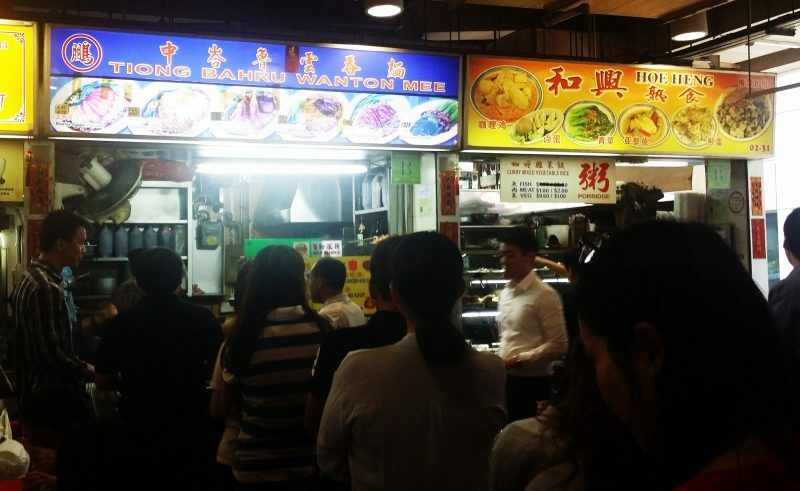 More often than not, one can tell that a stall is good if there are long queues stemming from it. I found Qiu Lian Ban Mian in the chaos mostly because of the snaking line in front of the stall and I soon understood why. 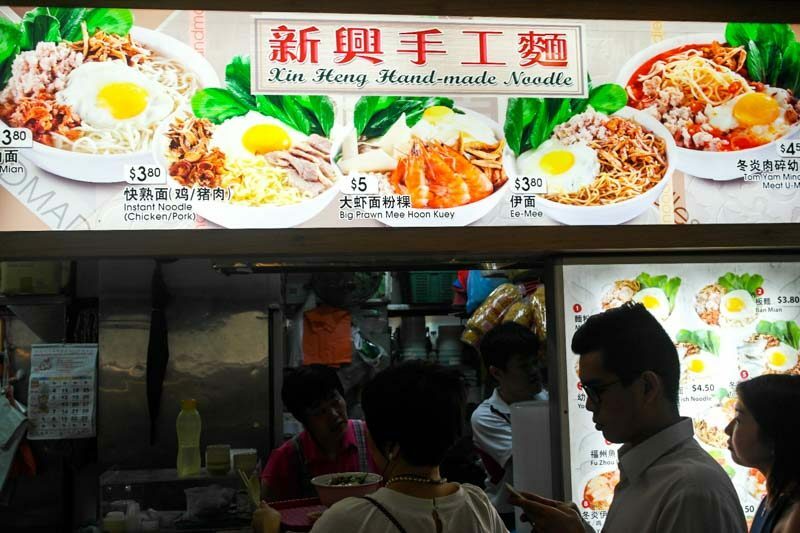 The noodles served at this stall are thicker than most and are hence very filling. 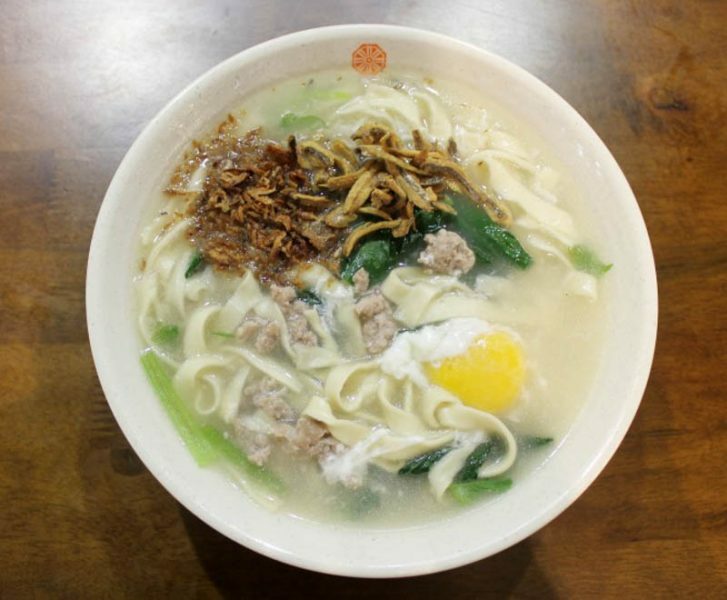 Paired with the not overly salty soup and the toppings like anchovies, minced pork and chives, this dish will most probably come through for any ban mian-lover out there. While I was completely stuffed after having tried several dishes at Lau Pa Sat, I was stranded because of a rain and had to stay on in the hawker centre (which wasn’t much of a problem because the place is well-ventilated and properly furnished with overhead fans). I decided to try a dish at the desserts stall and was not thoroughly disappointed. I had the Mango Milk with Ice ($2.70), the portions of which was generous for the price. 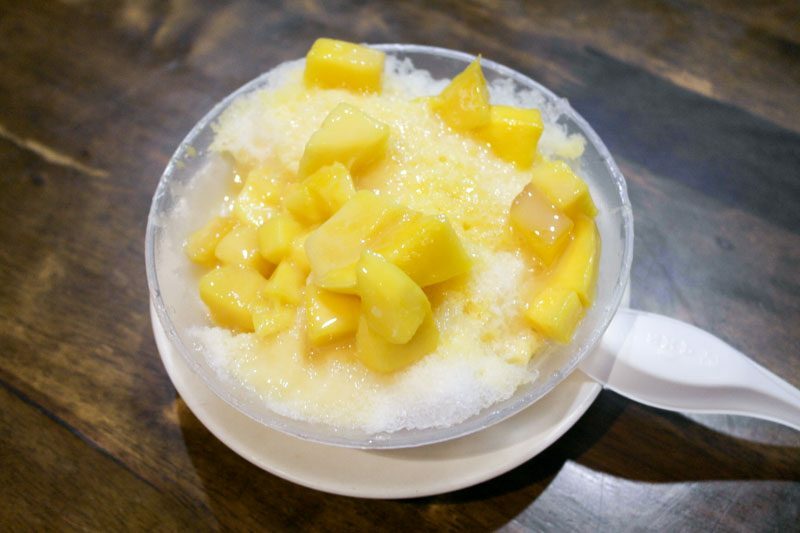 The dish was refreshing and rather sweet with the mangoes and condensed milk but the crushed ice helped to slightly balance out the flavours. 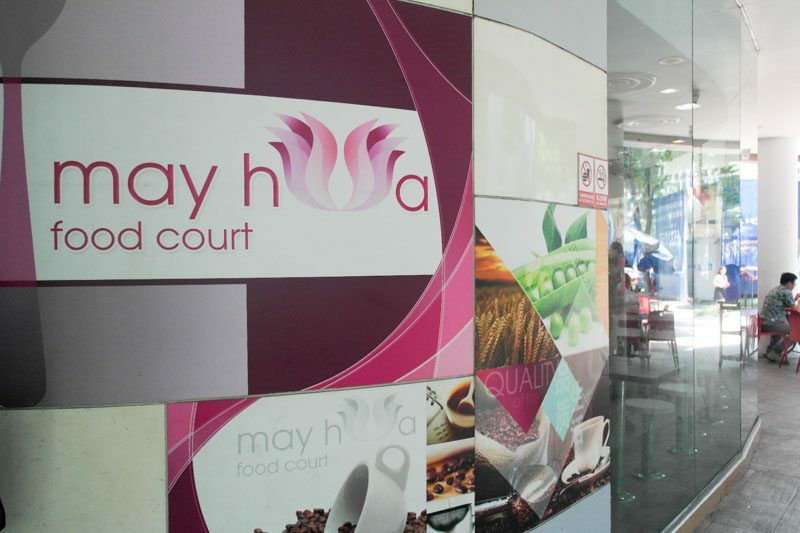 Moving on from Lau Pa Sat, I stumbled upon May hua food court in my search to find Golden Shoe Hawker Centre. While it looked like a rather nondescript food court, I must say that the quality of food served here did startle me quite a bit. The place was also jam-packed with people at lunch time so it was rather tough to find a seat. 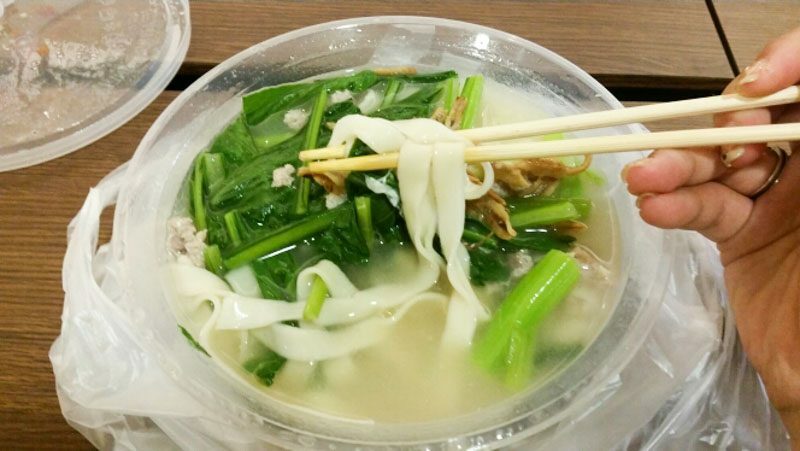 The Ban Mian ($3.80) sold at this stall is the sort of ban mian that will satisfy any ban mian cravings that you might have and will fill you up just right for you to continue on the rest of your busy work day. There is a generous serving of crunchy greens which help to balance out the textures of the soft noodles and minced pork so for those looking for a “healthier option”, this could do. I tried the Thai Style Chicken Rice ($4.50) which was really good. The chicken pieces were crispy, tender and the sauce was just the right blend of sweet and savoury. While the soup that came along with the dish was rather bland, it did help to cleanse our palate. 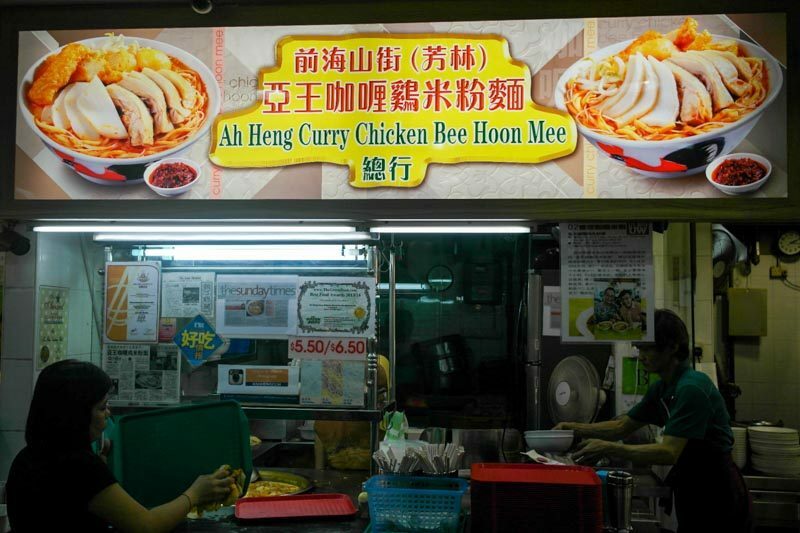 For $5.50, you can get a lovely bowl of Curry Chicken Bee Hoon Mee, where the curry is thick and packed with flavours, the chicken meat is tender and succulent and the tau pok soaks up a good amount of curry and oozes spice when you bite into it. A very satisfying dish if you are looking for something slightly spicy and delicious for your mid-day meal. I don’t usually opt for Thai food but when I went to Mayhua, I decided it wouldn’t hurt to try some Pineapple Fried Rice ($4.50) which came with a steamy side of Tom Yum Soup. 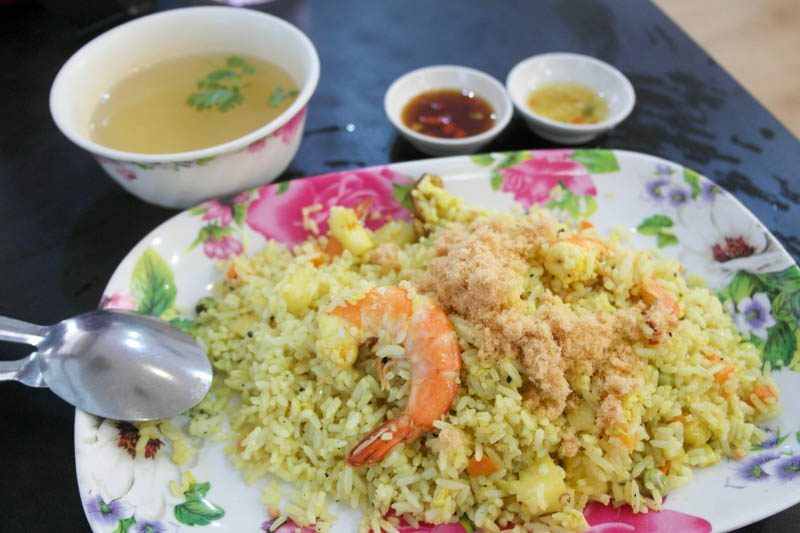 The fried rice was slightly sweet and had zesty bits of pineapple that intensified the flavours of the dish. There were three big prawns which were already de-shelled and ready to be eaten which was great. 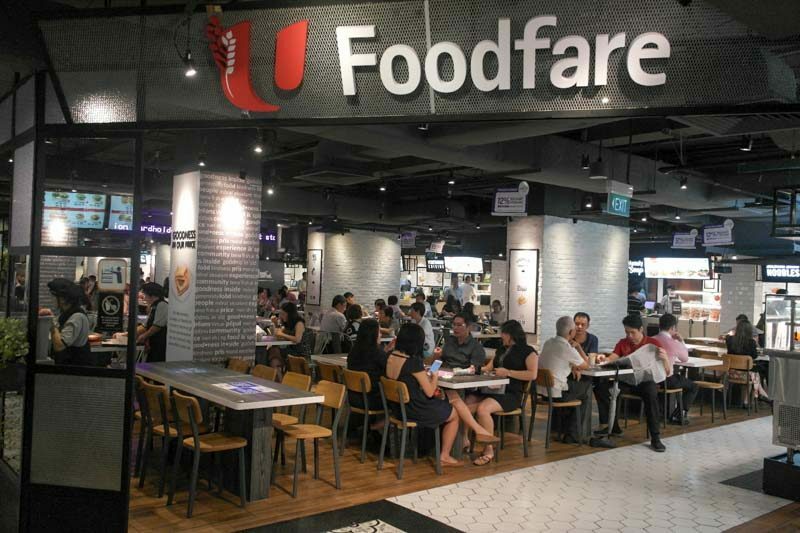 NTUC Food Fare is a spruced up food court located at the basement of The Arcade at Clifford Centre. The place looks like it has been nicely cleaned up and was a nice change of scene from the more hectic food places in Raffles I had been to. 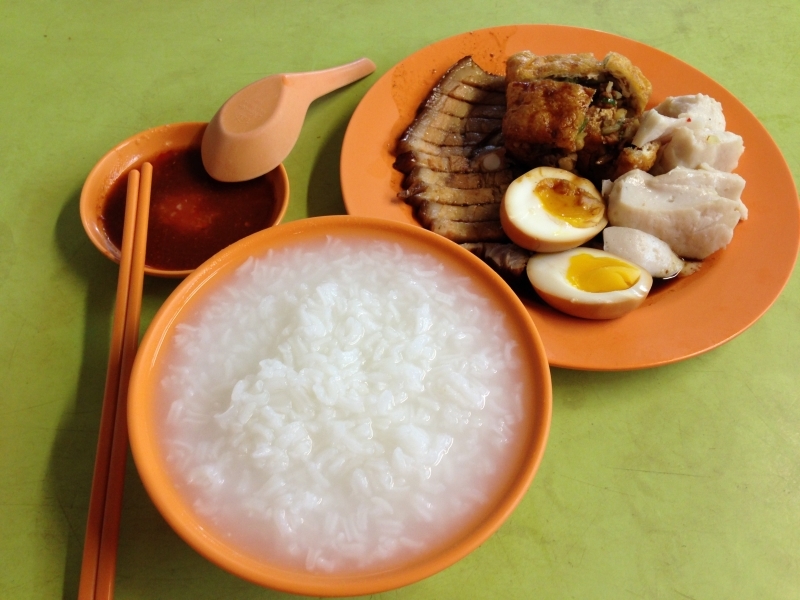 I headed for the Yong Tau Foo Stall first as I sought a steamy bowl of soup. 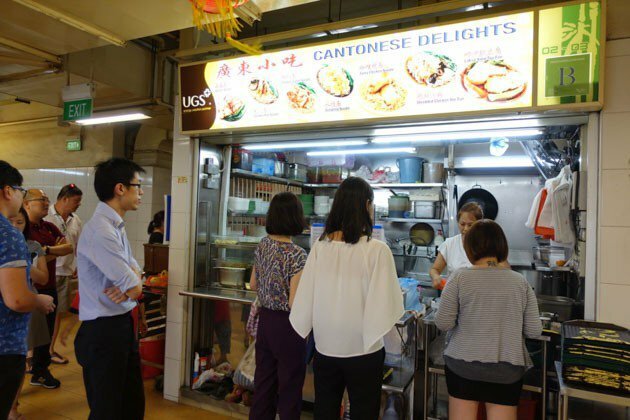 The servers at this stall were very warm, much like the bowls of soup Yong Tau Foo ($4 for 7 pcs) that they sell. I picked out seven ingredients – sausage, hard-boiled egg, tofu, fried dumpling just for $4 which is completely worth it if you ask me. Savour each ingredient with a side of spicy chili sauce and with the soft, pillow-y rice to experience complete bliss. While there are many stalls like the Ramen stall and the Korean Cuisine stall at this food court that looked rather good, I only had the opportunity to try two and this was my second pick – Ayam Penyet. 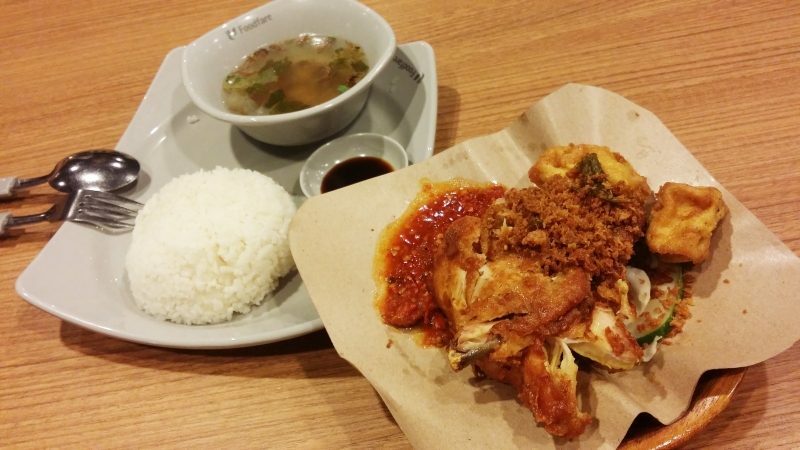 For those who value a good Indonesian meal, this stall will definitely do well for you. Their classic Ayam Penyet ($6) dish comes with a smashed up crispy, juicy chicken, some fried tofu and a side of spicy chilli sauce. I especially loved the sweet, dark sauce that can be added. 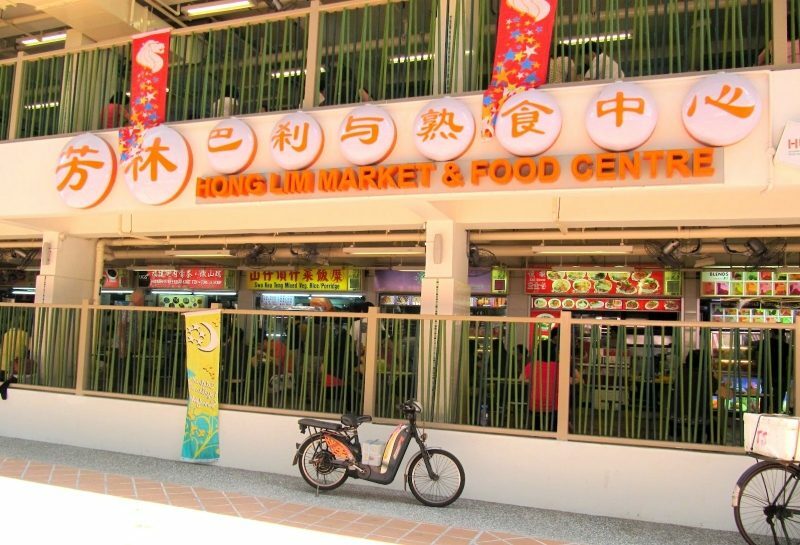 This 2-storied market and food centre that sits near the edge of Chinatown has housed several of locals’ favourite hawker stalls for several decades now. 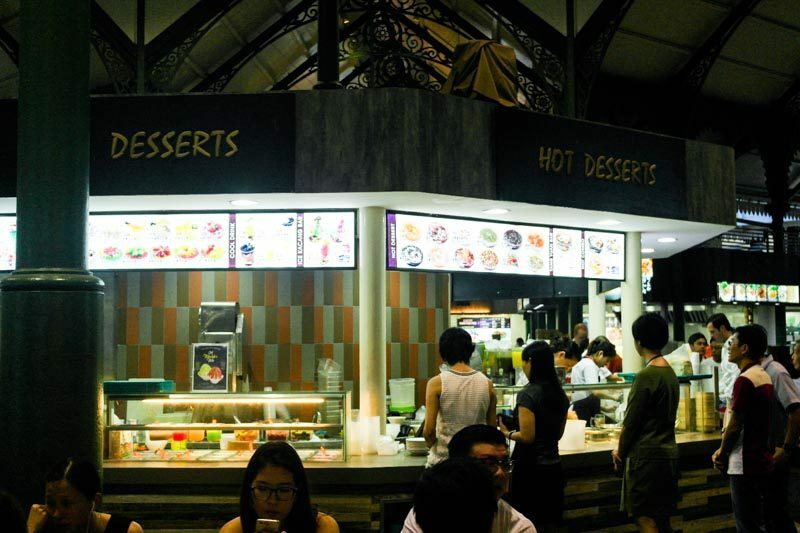 Tinged with a hint of nostalgia and well-decked out with a good number of hawker stalls, it comes as no surprise that many swarm to this area during lunch time as the selection of good foods is seemingly endless. 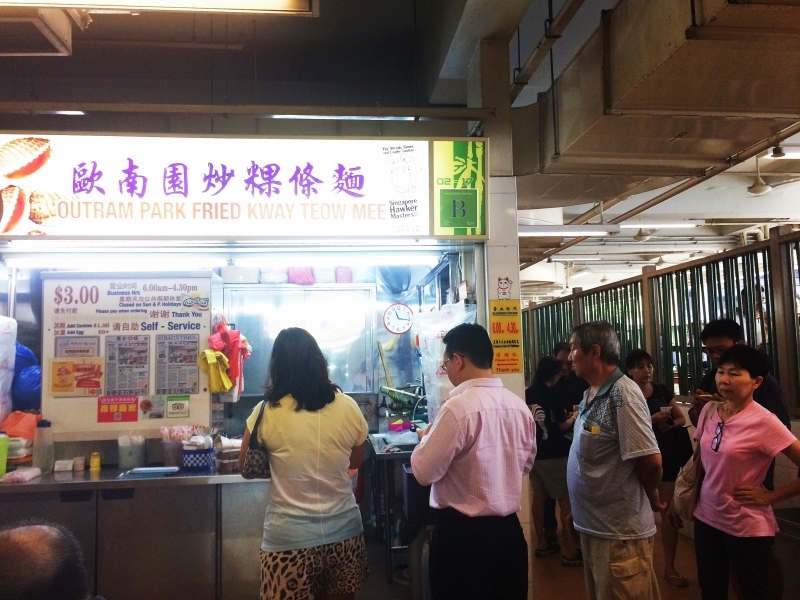 One of the stalls at Hong Lim that is highly-reputed is Outram Park Fried Kway Teow Mee which, as the name so obviously suggests, serves delicious plates of Char Kway Teow. 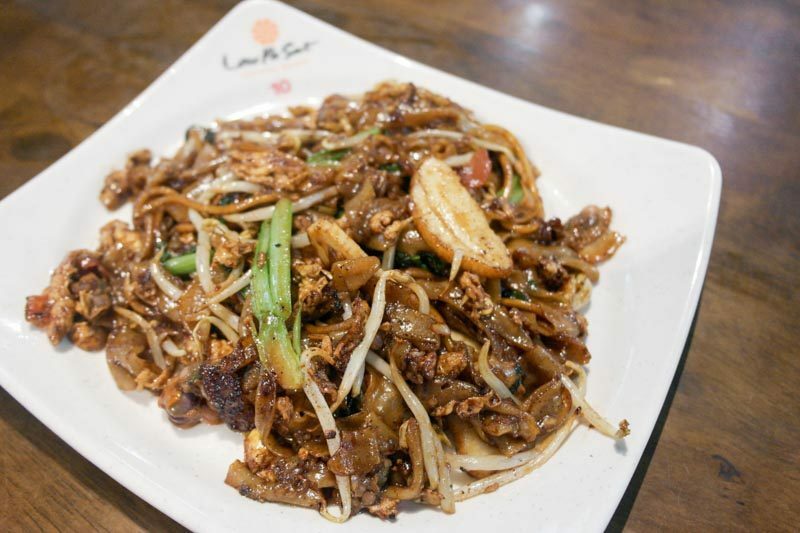 Priced at $3, one plate of Char Kway Teow is packed with a lot of savoury flavours from the soy sauce, scrambled eggs, wok hei and crunchy pork lard. 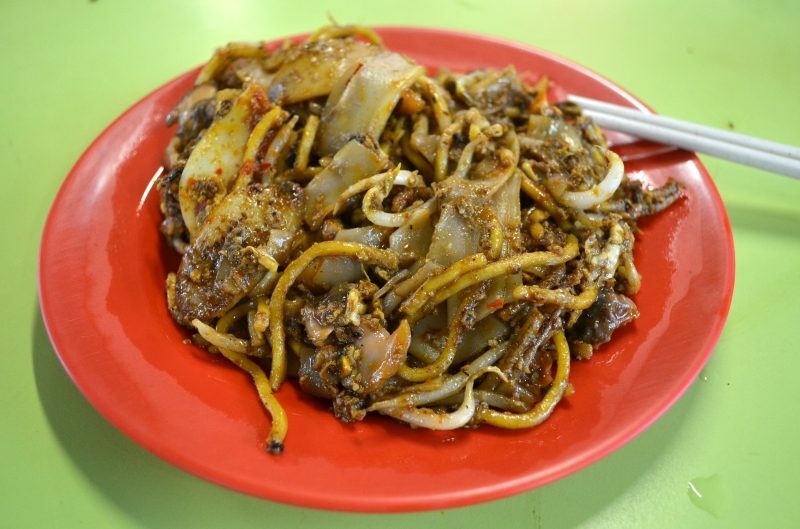 The Char Kway Teow here is so delicious, you’ll feel far from satisfied when you’re done as you’ll only want more. The queue is absurdly long though, so do be prepared to wait. I would not recommend this if you are pressed for time. Another noodles stall that has made a name for itself, having been in the business a long time coming, is Ji Ji Wanton Noodle Specialist. 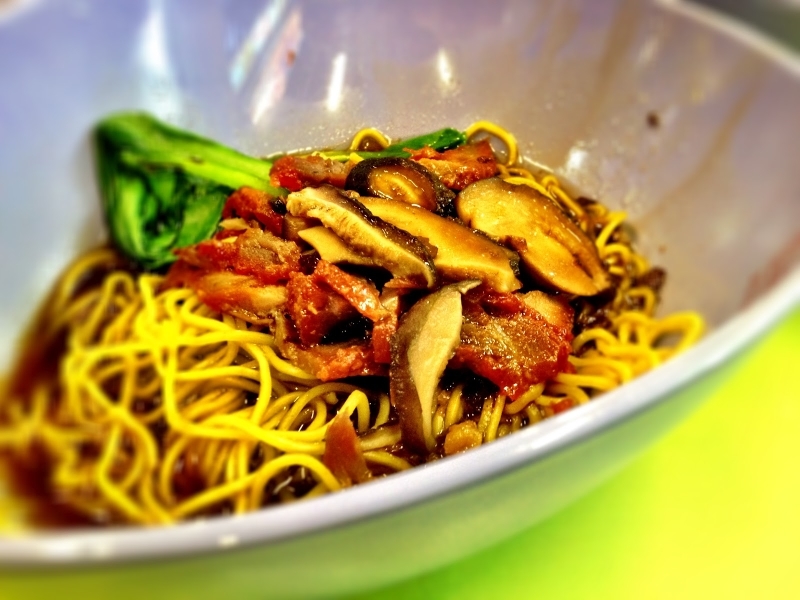 Their bowls of wanton mee come with a good portion of sweet and succulent char siew, juicy mushroom slices and well sauced-up noodles. I always love it when a Yong Tau Foo stall offers laksa soup as an option. 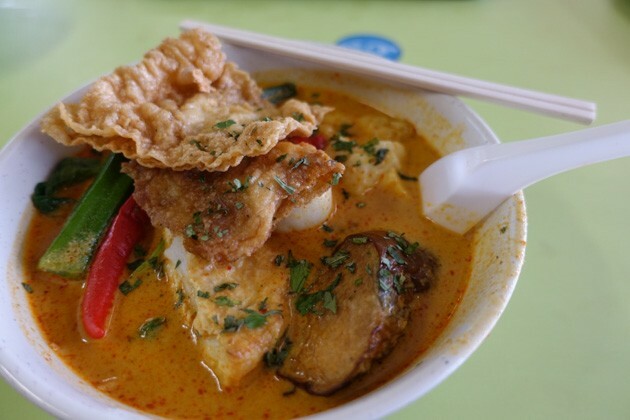 This Cantonese Delights stall at Hong Lim offers just that – Laksa Yong Tau Foo ($4). 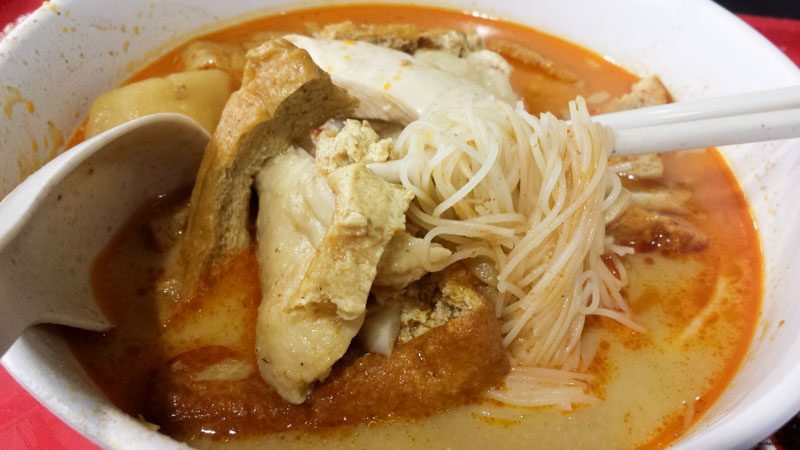 The coconut-based, lightly-spiced laksa soup is very smooth and silky and has a nice, traditional Hakka yong tau foo taste with an edgier spin on it. It is very satisfying to dig into a bowl of porridge that is of the right consistency, of the right amount of water and of rice. I usually don’t go for the thick, pasty sort of porridge so the one sold at Teo Heng Teochew Porridge definitely sits well with me. Apart from the beautiful bowls of porridge sold here, the braising sauce used in the side dishes is scrumptious and adds a lovely piquancy to the entire dish. 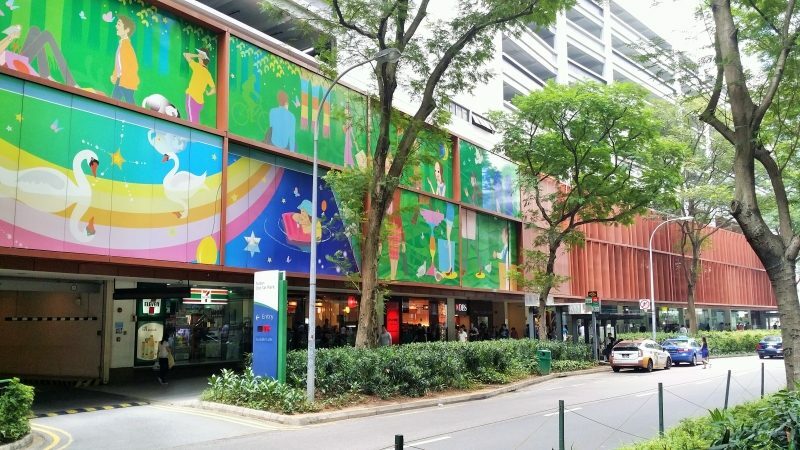 Golden Shoe Hawker Centre is conveniently located at the heart of the Central Business District which makes it very accessible for busy office workers at lunch time. 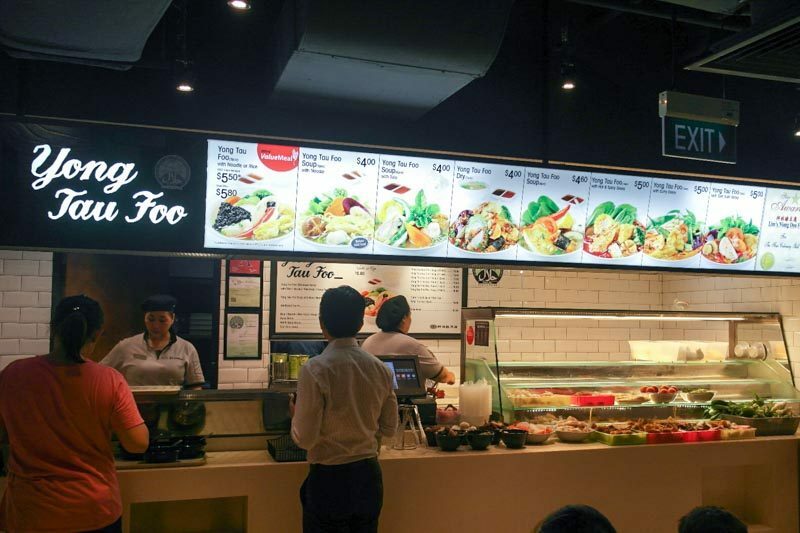 Most would prefer not to eat at this place mainly because it can get quite stuffy but if the heat becomes unbearable for you, you should simply dabao the food back to your office as there is a good number of superb stalls here. The Nasi Lemak ($3) served at this Nasi Lemak stall comes with the uniquely-green, very flavourful green coconut rice, one chicken drumstick, half a fried egg, otah and some sambal chili. 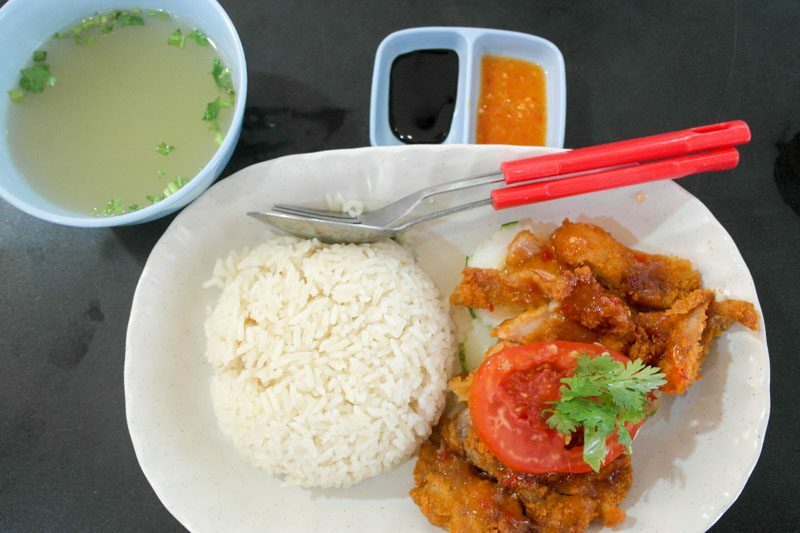 The coconut rice is extremely fragrant and is essentially the star of the show and there is more than enough to be had with the likewise savoury ingredients like the otah and fried chicken. 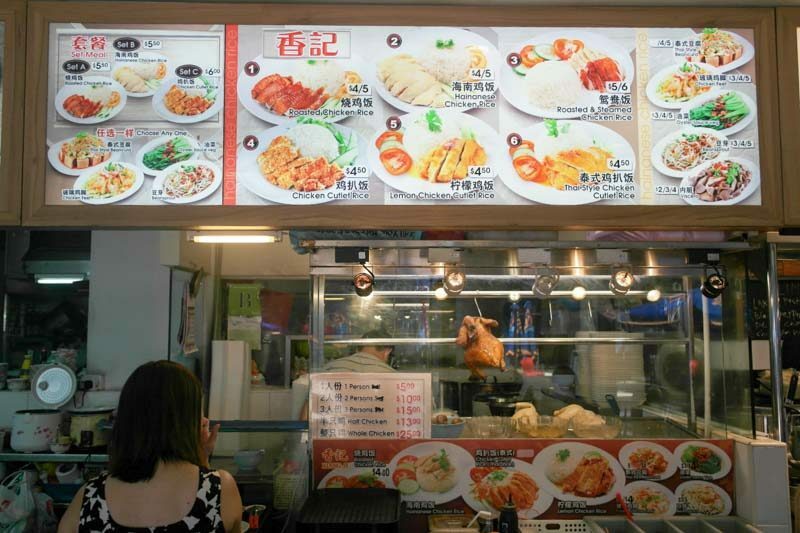 The past few times I’ve gone scouting for food at hawker centres across the island, I’ve encountered Tong Fong Fatt at least 4 times so it did not really catch me off guard when I came across this stall at Golden Shoe. 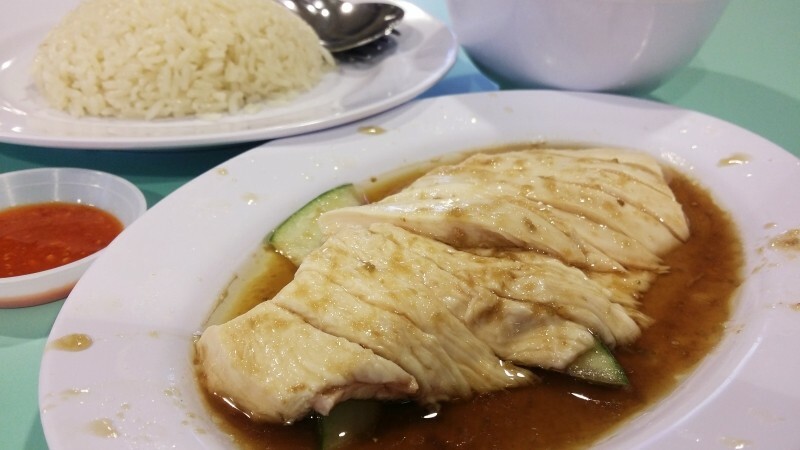 The chicken is consistently generously slathered in sweet and savoury soya sauce, the rice is always deliciously fragrant and there is absolutely no hassle with chicken bones. 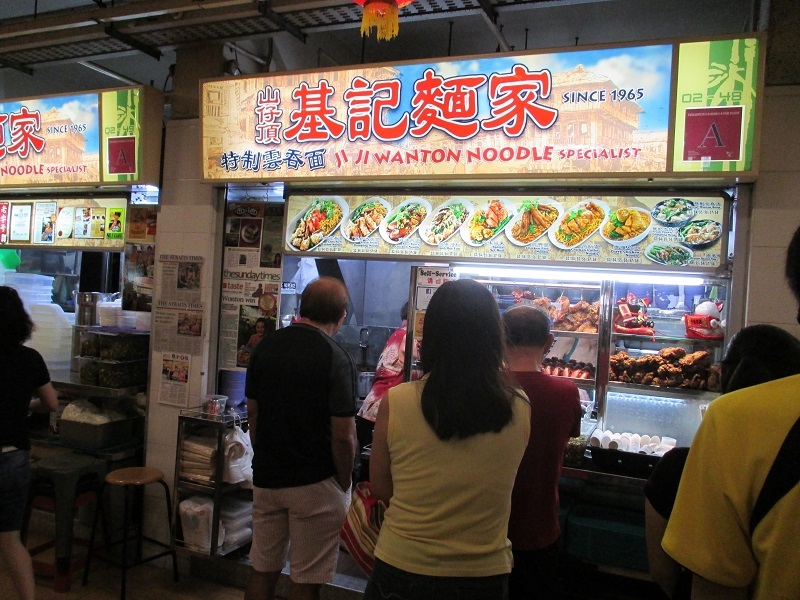 The Wanton Mee ($4) served at this stall has got to be one of the better ones served in Singapore. 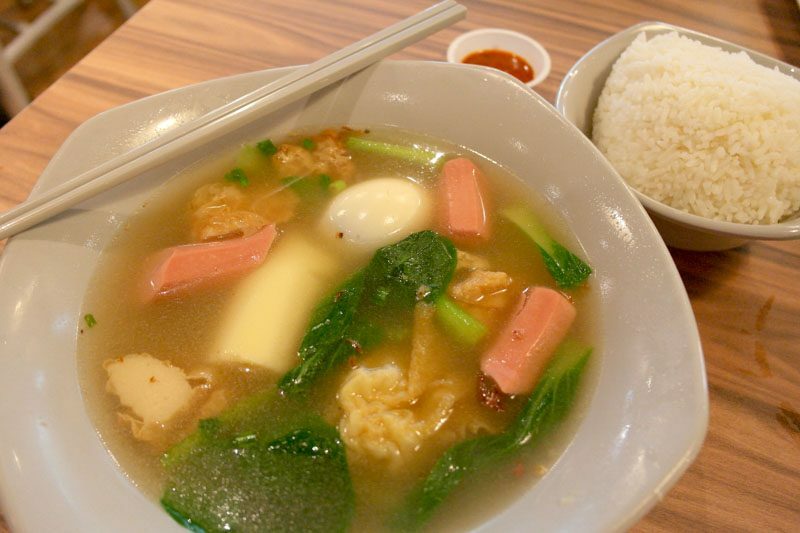 There is a very generous serving of ingredients like fried wantons, tender char siew meats, a spring roll, green chilis and this entire savoury dish comes with a lovely bowl of wanton soup. If that’s not completely worth the full four dollars, I dont know what is. There are so many good hawker stalls in the Raffles Place area… The number is rather overwhelming and almost makes me want to take up a corporate job in an office around the vicinity. 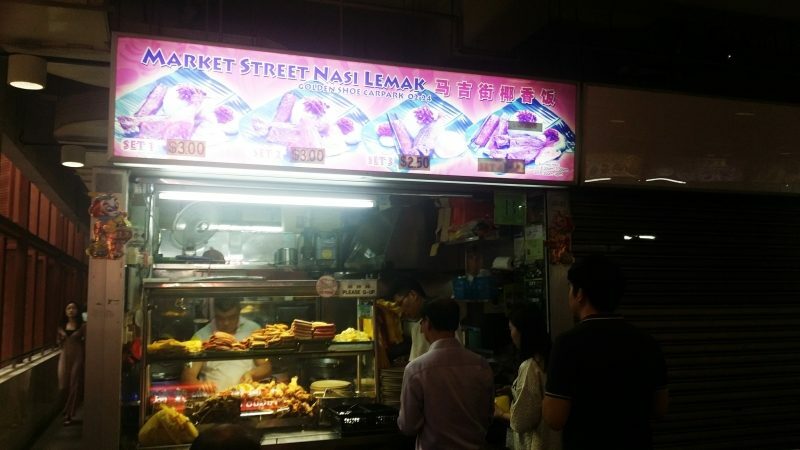 Since there would undoubtedly be several commendable hawker stalls that are not mentioned here, it would be nice if one or two busy folks can share what their favourite go-to Raffles Place food stall is in the comments. I adore baobab trees, nachos, poetic things & groovy tunes.